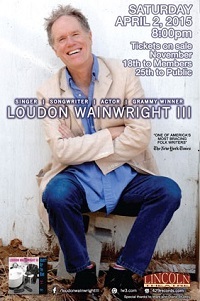 Born in Chapel Hill, N.C. in 1946, Loudon Wainwright III came to fame when Dead Skunk became a Top 20 hit in 1972. He had studied acting at Carnegie-Mellon University, but dropped out to partake in the “Summer of Love” in San Francisco, and wrote his first song in 1968 (“Edgar,” about a lobsterman in Rhode Island). He was soon signed to Atlantic Records by Nesuhi Ertegun, and was lured by Clive Davis to Columbia Records, which released Dead Skunk. His songs have since been recorded by Bonnie Raitt, Johnny Cash, Earl Scruggs, Kate & Anna McGarrigle, his son Rufus Wainwright, and Mose Allison, among others. Additionally, Wainwright has co-written with songwriter/producer Joe Henry on the music for Judd Apatow’s hit movie Knocked Up, written music for the British theatrical adaptation of the Carl Hiaasen novel Lucky You, and composed topical songs for NPR’s Morning Edition and All Things Considered and ABC’s Nightline. An accomplished actor, he has appeared in films directed by Martin Scorsese, Hal Ashby, Christopher Guest, Tim Burton, Cameron Crowe and Judd Apatow. Wainwright has also starred on TV in M.A.S.H. Bellingham's Scarlet Locomotive opens the show!